Not only is he one of the awesome minds behind Robot Chicken (and also occasionally the galaxy's snarkiest pilot), but it turns out Seth Green is also pretty good at making custom action figures, looking at this set of toys based on the Ravagers he gave James Gunn for Christmas. 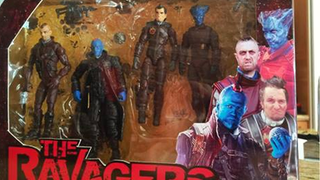 A free Von Spears with 5 proofs of purchase from Guardians of the Galaxy figures? Hell yeah. The world needs more Ravager figures - it's cool to see that Seth Green is leading the vanguard on that.